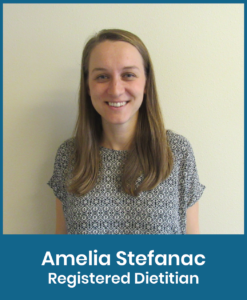 Amelia Stefanac is originally from the Upper Peninsula of Michigan. She completed her undergraduate studies at Western Michigan University, and completed her dietetics internship through Cedar Crest College in Pennsylvania. Amelia gained her clinical experience spending two years working in the hospital and outpatient settings at a variety of locations while working for U.P. Health System. She then moved to a position developing nutrition services for a mental health clinic in Kalamazoo, MI, which included nutrition education services, connections to community food resources, and partnerships with local organizations to provide cooking classes. Amelia and her husband Pierre enjoy spending time outdoors biking, hiking, and being by the water. Amelia loves to garden, cook, and all things food. She and Pierre are looking forward to becoming a part of the community and exploring the Pacific Northwest.